Gladys Castillo, an early college high school student at Eastfield, was six months short of being born on the American side of the U.S.-Mexico border. In her parents’ hometown, San Luis Potosi, Mexico, the American side was rumored to promise jobs and schools. The Mexican side, the Castillos’ side, had family, comfort and a home. But Gladys’ parents, Maricela Torres and Pedro Castillo, knew that with their humble income, they would not be able to provide for their 6-month-old daughter. So, while following a border smuggler, wearing all black, and with Gladys secure in their arms, they made the 454-mile journey to Laredo in the late 1990s. The dayslong trek involved crossing angry rivers and consuming the least amount of water and food possible to ensure their physical load remained light. It required sleeping in the wide-open Sonoran Desert — a place with extreme temperatures, home to deadly rattlesnakes, centipedes, and scorpions — and having faith that the coyote, a paid border smuggler, wouldn’t lead them to a human trafficking ring. The Castillos knew of these risks and the danger of being caught by Border Patrol agents. But they decided that it was worth it for one shot at the American dream. Gladys Castillo is one of nearly 700,000 undocumented immigrants brought to the United States as children and protected under the Barack Obama-era Deferred Action for Childhood Arrivals program. The program allows those who qualify, known as Dreamers, to work, go to school and live life without fear of being deported. President Donald Trump ended the DACA program in September with a six-month grace period for Congress to make DACA into law. Several proposals were made, but none gained enough support to proceed. Lawmakers have since turned their attention to gun control following last month’s school shooting in Florida. Trump’s grace period ended March 5, but a California judge has ruled that DACA must continue pending the outcome of a lawsuit by the University of California on behalf of Dreamers. Dreamers say they feel left in limbo, uncertain about their futures. Everyday decisions such as a simple trip to the convenience store could be life changing. Over the weekend of Jan. 26, U.S. Immigration and Customs Enforcement made 86 arrests in North Texas and Oklahoma in a three-day operation. Castillo is just one of those who have been affected by DACA’s revocation. General studies major Dulce Giles, 21, said she is too afraid of deportation to continue her regular life. Giles, like many other DACA recipients, was brought to the U.S. at a very early age. Her mother brought her here. Leaving this country is not an option Giles has considered. But with the end of DACA looming, Giles has opted out of registering for any classes this spring and instead will focus on working and saving money. Applying for DACA did not guarantee acceptance. After twice renewing her DACA status, Giles encountered some trouble the third time she applied with three months remaining on her current permit. It took the letter an extra three months to get approved, leaving her out of work. The DACA application costs $495: a $410 work authorization document fee and $85 biometrics fee. It must be renewed every two years, and applications must be filed properly or the application is invalid. There are no refunds. Hiring a typical immigration lawyer costs between $100 and $300 per hour. Expenses can quickly add up for a college student with tuition and book payments. This leaves DACA students wondering if their money is better spent elsewhere, rather than for tuition and books that will potentially lead to no reward. Families and individuals desperately searching for help turn to Luis Gonzalez, 30, and “Raices” a nonprofit immigration law services firm. Gonzales, a legal assistant, has seen firsthand how the current immigration changes have dwindled the spirits of young immigrants. Statistics show that allowing DACA recipients to work legally and pay taxes has been a boost to the U.S. economy. According to the Center for American Progress there are an estimated 124,300 DACA recipients in the state of Texas, and an estimated 108,141 are working and paying annual taxes. Removing DACA and all those workers would result in an almost $6.3 billion loss in the Texas annual GDP alone. Edith Delgado, a second-year student at Eastfield, has seen the effects of the turmoil on her fellow students and her family. “You gave them hope, and then you just took it away,” she said. Castillo worries that Immigration and Customs Enforcement could pick up her parents at any moment. And without DACA, she could be sent back across the same border her parents had put so much faith in crossing. Castillo knows the sacrifices her parents had to make to immigrate to a land as close yet foreign as the United States in hopes of a brighter future for her. She has never physically met most of her family members. All she knows of Mexico comes through the hazy stories her parents tell her and through Skype calls with her relatives on special events like her birthday. Pedro Castillo works 12-hour shifts in construction. Torres works at an ice-cream shop and cleans houses for extra income. The work ethic that her parents live by made a mark on Gladys Castillo. She has always been a straight-A student with hopes of becoming an orthodontist. She enrolled in the Samuel Early College High School at Eastfield, a program that allows students to graduate with both an associate degree and a high school diploma. Castillo is in the top 5 percent of her class. Castillo also fears being separated from her 7-month-old son, Jonathan Jr. She married the baby’s father, who is a citizen, and considered applying for citizenship. But the naturalization process costs thousands of dollars. Lawyers advised her to pursue DACA instead. It’s been a year since she applied, and her application is in review. She has to live with the fear of being separated from her family at any time. “I drive to school because I have no other option,” Castillo said, “My husband works and my mother-in-law takes care of my baby, so she can’t bring me to school. Although her parents are supportive and told her that it would be OK if she took time off school to focus on her newfound motherhood, Castillo knew that staying in school was a priority for her. “My mom and my dad were like, ‘If you need money for school, or if you just want to take a break, you can. Or if you want to do online.’ But I was ready to keep on going to school,” she said. Her dream is to get accepted into dental school. “All of that stuff takes a lot of time, effort and money, and I just want to give my family a good future,” she said. And this determination has paid off. Because she is undocumented, she cannot receive federal aid. But due to her high grades, every university she has applied for has offered her scholarships. Texas Woman’s University, Texas A&M-Commerce and the University of Texas at Arlington have all offered her admission and up to $5,000 worth of scholarships a semester. 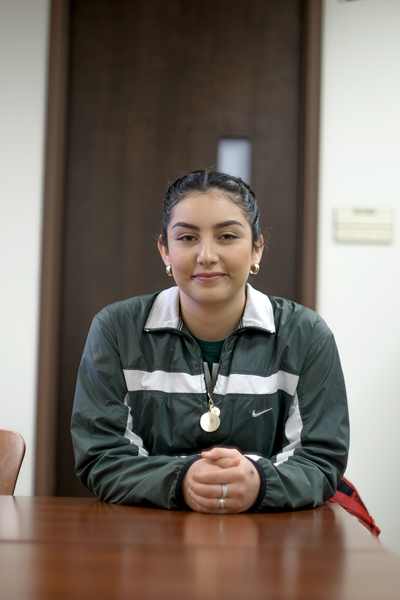 With her DACA application still in review and the future of the entire program completely uncertain, Castillo feels that her future is hanging on by a string. Being sent back to a country where she had only resided as a newborn is terrifying. Castillo feels like an American.